This is a small table and chair for art or writing. Above there is a child height blackboard that is specifically useful for the toddler who can use large chalks on this. The wooden box on the floor contains colouring books, dot to dot books and other activity books. Around the perimeter of the room we have bought cheap shelving from Ikea to store their toys on. 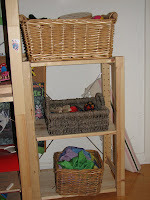 This has proved really useful to keep smaller items out of reach of the toddler and making her toys accessible without the need to climb up. 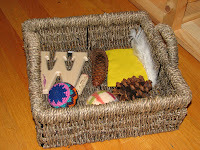 We use wicker baskets and crates to store many items, also glass jars with a variety of lids for craft stuff. Wooden knob puzzles store in this unit. A comfy area for reading. The centre of the room is empty with a large rug in it for the children to set up their activities. They also all own a small roll up type rug in case they wish to do a jigsaw or something similar that they don't want disturbing. This isn't really working that well at the moment, the first frustration, despite them using rugs at school. My current goal is to create a peace area. We struggle daily in the house with conflict (mainly minor) that requires a lot of squealing, not much resolution and often some tears. In general the kids play pretty well, but they are not so hot on working out their disagreements without trying to include me on one or other side. I have bought a book on resolving issues and regaining peace which I aim to read for hints and tips. 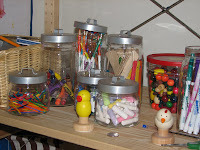 Art and craft material stored in glass jars so the children can see what is in each. Guatemalan knitted balls are filled with beans and make a great "second" ball (after the bog-standard bean bag!) as they are easier to catch. This is our newest addition, on the same vein as my peace bell. 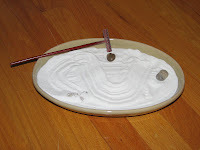 This is a zen garden that I am hoping the children might use in order to calm down sometimes or relieve their tensions........or it might just end up on the floor! 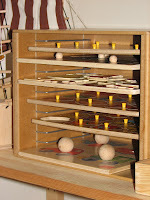 Manipulative games - twisting, screwing and tightening. 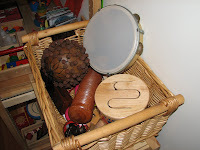 Our music basket, full of percussion instruments. None of their time in here is guided as I really believe strongly in free, imaginative play. Yes, we have the usual gathering of lego and playmobil that the boys in particular, love intently and will play with for hours. I wouldn't want it any other way. 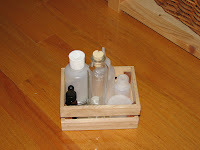 This, for me, is the biggest difference between incorporating Montessori in the home rather than at school. Home is a time to be excessively creative and imaginative. It is the time to show the free spirited side. I certainly don't tell the children how to use these toys, that is their choice. This is a small box of bottles, primarily for our toddler to open different types of lids, screw tops, push tops, a cork top, a dropper top and a tin etc. Most often they get used in another game, which is fine too, the skills are still being applied! This is a texture basket. Again I am working on adding to this. This is based on sensory learning. Currently it consists of a cork, two types of pine cone, a ball, a wooden letter, a beanbag, a felt ball and a feather. Another box that is aimed at our toddler (particularly when she lies on her side - sorry folks!). This will eventually contain items with different fastenings. We also have a basket of playsilks that can be used as props for their games. More often than not they end up as a dressing up item rather than "the sea" or "a mountain". These are some cheap trays for sorting (or feeding dolls dinner!) Alongside that I also have jars of sorting bears for colour sorting and phonic tiles for games with my middle son who is just learning to read. With regards to encouraging his reading, he has a basket of progressive readers that he has just started on. Most nights he reads us a few pages from one of these and then we read to him.......or vice versa of course. We have a mix of books from the US (BOB books and some other simple beginner readers) and the UK (good old Oxford reading tree). Over the summer we are going to bring back our family read that we had last year and in the winter. Last summer we did Harry Potter with our eldest and then Edward Turlane. This summer he wants to read The Lion, The Witch and The Wardrobe. Obviously we have many dolls, lego, playmobil, cars, dump trucks etc etc in the house. As i said, this is NOT school and I don't want them to think of it as such. I love the fact they use the more unusual items in their games and think that is a great reflection of their imaginations. Thank you for posting this info. 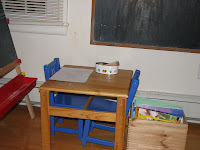 My child just started MS school and I am intrigued how they set up their room and may try and mimic it. Thank you! 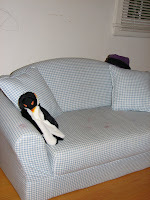 I am looking how to set up a play room for 5 month old baby in the house, do you have any idea? My advice would be to start small. Begin at their level with not too much to over stimulate. 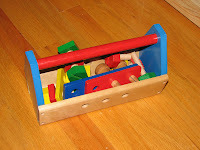 Often Montessorians like to put a mirror on the wall at ground level with a mat next to it for floor time. Perhaps you could then put a wooden bar above it for pulling themselves up when the time comes. 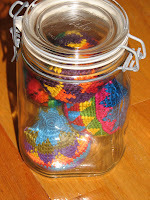 Hang a ball from the ceiling and keep things on the ground in storage baskets or containers. Simple is key at this age, that means fabrics and textures as well as the number of "operations" a toy has. 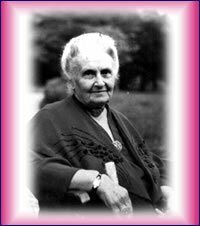 Think about what a toy may "tell" a child ie: if you give them a rattle with the beans enclosed inside, how do they discover what makes the noise or what the noise is? 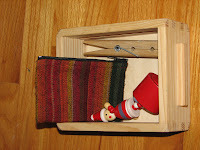 If you give them a rattle where a bell is caged, the child gets the idea as to how the sound is made - does that make sense? 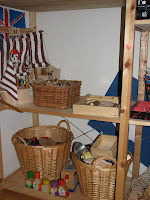 lots of scarves, simple wooden toys, tins they can put things into and out of. You can then alter things as the child grows, move things up a level to "crawling" , then "standing" then taller child heights too.